As a recent South Park episode demonstrated, the internet is very rarely a “safe space.” Those who heedlessly post pictures on social media sites had better damned well prepare for those pictures to attract negative comments. That’s the tough life lesson Silicon Valley IT guy Jon Hendren, whose enviable Twitter handle is @fart, learned over and over again for months when he innocently tweeted this picture of his new shoes on February 19, 2015. 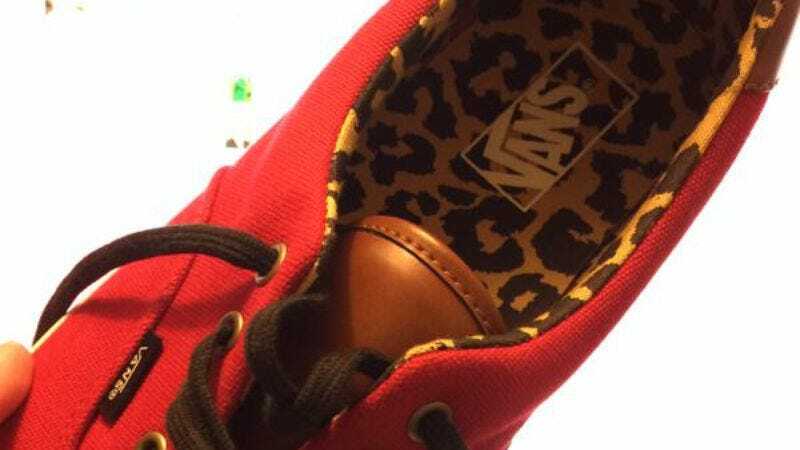 In the now-infamous tweet, Hendren himself acknowledges the ridiculousness of his freshly purchased, bright red Vans with leopard-patterned interiors. Hendren probably thought that was the end of it. Foolishly, he had not reckoned on the cruelty and creativity of fellow Twitter users David Thorpe (@Arr) and Breakfast Haver (@weedguy420boner), both of whom seem to harbor a never-ending grudge against Hendren’s tacky footwear. Others soon joined this hateful campaign, and Hendren found himself in the truly odd position of having his shoes relentlessly mocked on social media for months on end. The conflagration reached such heights that it captured the attention of New York magazine’s Brian Feldman, who filed a thorough report on the Twitter skirmish, and wrangled statements from the belligerents themselves. Thorpe, the agitator, was enthusiastic about his online triumph. Glad you enjoyed the shoe content. Interactions have been through the roof. All credit really goes to my social media team; once I saw the viral opportunity the shoes presented, they agreed to put in a late night coming up with some fantastic content. They stayed totally on-brand, on-message across the board, and I think that’s really come through in the engagement numbers. Hendren, the victim, was gracious in defeat and held no ill will toward his assailants. And, like Thorpe, he resorted to the language of internet marketing weasels when delivering his response. There’s no real hard feelings between Dave and I. I think he’s really smart and really funny. Only thing is, he tends to hire vengeful scoundrels for his social team. The entire reason the roast went on as long as it did is that they knew from having worked with me that my head writer Paulo had already gone to bed, leaving me essentially unable to respond. Meanwhile, anyone who wishes to dive head first into a bottomless, bile-filled pool of shoe-shaming may do so below.